I’ve had an admittedly marginal attitude regarding the central Florida town of Winter Haven ever since the first time I stayed there after flying in for the annual spring airshow in nearby Lakeland called Sun n Fun Fly-In back in 2002 or 2003. To me, its commercial strip was naught but strip malls and modest hotels and chain restaurants. Basic food and beer, a pretty clean room, and a quiet night’s sleep were all I sought back then. 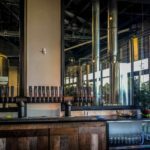 But the Craft Beer Life has arrived in this town amongst the groves…and thank goodness for that. 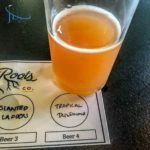 On our trip to Florida in April, we had cause to swing through on Highway 17, and I swear I caught the scent of hops mixed with orange smash (actually, I’m ashamed to admit that Trip Advisor tipped us off). 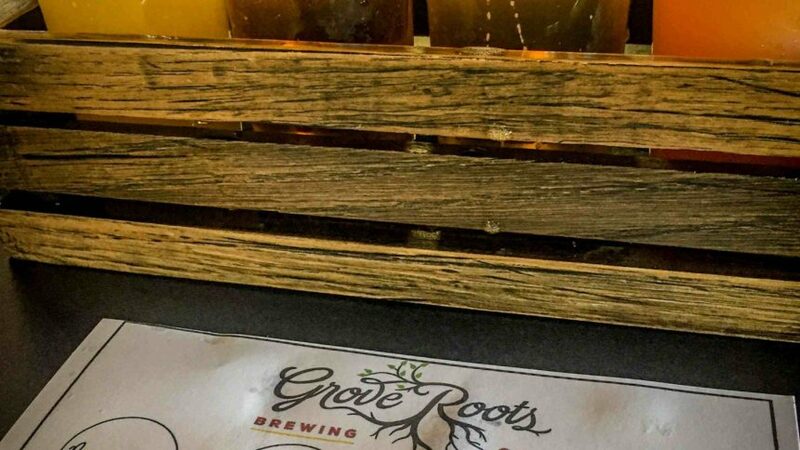 We pulled into Grove Roots at 5 pm on a Friday afternoon, to find the parking lot full, the Italian food truck queued up, and picnic tables full of families and friends outside. 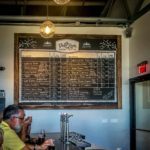 The new warehouse features simple furnishings: rows of tables fronting a long bar, with taps marked in chalk and a big board of lovely brews overlooking it all. A clear window allows for a view into the tank room. We sat at the bar, feeling lucky to find two seats front and center. My boyfriend went out to the truck for truffle parmesan fries (yum), and I considered the dozen beers and a cider or two from which to choose. Stephen opted for a Lip Ripper Simcoe IPA; since he pulled the short straw driving, he would limit his beer journey to one. I took a taste (of course), and found it to be a well balanced IPA, at 6.3% abv, and creamier and a bit more bitter on the palate than the other ales further along in my tasting. A good start! 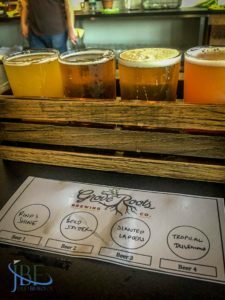 For my foursome flight, I stuck to a citrus theme: Grove Roots certainly positions itself in this style, and for good reason. We passed through acres and acres of orange and lemon groves on our way out of town, along with a couple of large citrus processing plants. No doubt the orange reigns supreme in central Florida! Furthest to the left in the rack, the Rind & Shine was a Belgian Wit with tangerine, at 5.4% abv. I enjoyed its classic coriander seed fragrance, with even more of the floral notes on the palate. 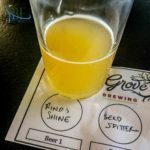 The Rind & Shine’s a bit hazy with good color, and was probably my second favorite of the flight: I would go back for more. Furthest to the right in the rack, I chose a sour, the Tropical Dilemma, at 4.8% abv. While distinct and not for everyone, this tropical sour ale I found true to form, with sour papaya and grapefruit peel. Refreshing for a hot day, this hazy ale had almost a juicy look to it, like ruby red grapefruit juice squeezed straight out of the fruit. Not bad! Third, and perhaps the most disappointing of the flight, the Seed Spitter American wheat ale was advertised with Valencia orange, at 6.0% abv. Certainly, some fruit came through, but with a creamy sweet orangesicle taste to it, and no nose to speak of. 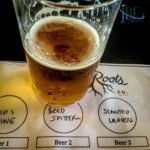 Its clear golden color made me think of a regular lager–and in truth I found little flavor of real orange there. 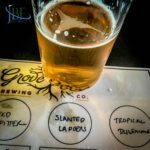 My favorite of the flight, the Slanted Ladders White Pale Ale, featured citra hops and a clear color like a polished oak floor. At 5.8% abv, this ale didn’t knock me over with alcohol, but instead enticed me with beautiful florals on the nose and palate, and a good follow through. This is the one I would order again right away.